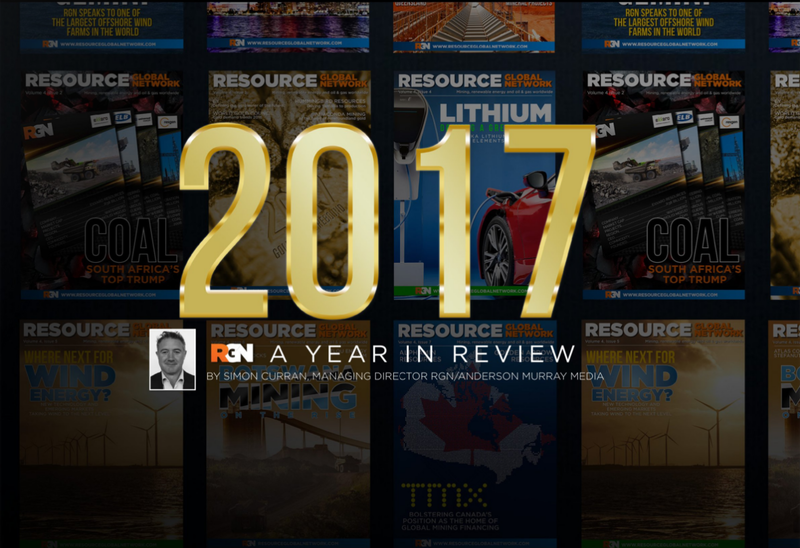 2017 has been a year of progress in the global resources and renewable energy sectors, and myself and the RGN team have taken great pride in documenting this story through our in-depth analysis and wide-ranging spotlights on a host of exciting companies across the industries. Here is my review of the year that was. To kick off 2017, the RGN team focused on Australia and its expansive resources sectors. After years of depressed prices and exploration programmes being shelved across the nation, the winds of change began to blow in the right direction once again. A gradual increase of prices in both precious metals and oil and gas saw the cobwebs of the downturn begin to be brushed off at the tail end of 2016. Subsequently, the beginning of this year gave birth to a marked increase in the number of projects receiving funding and being progressed in Australia. We interviewed New Hope Group’s boss Shane Stephan and discussed how the company is expanding its coal production capacity across sites in Queensland and its diversification strategy into becoming an oil player. Furthermore, we also spotlighted two fundamental representative bodies to the resources sectors in APPEA and AMEC. These features highlighted the important work they do and provided an ongoing outlook for Australia’s mining and oil and gas sectors. In issue 2, RGN looked at fossil fuels and saw a shift in attitude from some global powers. The Paris climate change agreement represented a sharp change in mindset when it comes to carbon emissions and electricity generations. 195 countries, including the US and China, signed the agreement to reduce emissions to less than 2 degrees. South Africa signed the agreement, however the country still relies on coal to power the country’s key industries and coal will continue to play a fundamental role in meeting South African energy demands for years to come. In this issue, we highlighted the importance of coal in South Africa, the key players in the sector and what the future looks like for coal-powered electricity. Our exclusive interview was with the World Coal Association, which offered readers a global perspective on coal and how this will impact South Africa. Elsewhere, we interviewed a variety of different South African coal miners and mining service providers. Exxaro’s executive head of coal Nombasa Tsengwa described how the company profited through a global price downturn and we featured firms such as Resource Generation, ELB Engineering and RSV ENCO. Next, the RGN team produced our annual gold-focused issue. The gold industry experienced a healthy rebound in 2017. The major boost to gold miners who experienced trouble and strife last year was the return of the gold price. Although nowhere near the dizzy heights of US$1,780/oz we saw in 2012, gold spot prices rose to levels a far cry from the US$1,060 of January 2016. Our lead story was the World Gold Council, after we spoke to its head of investor relations John Mulligan, who discussed the organisation’s Gold Demand Trends 2016 report and how global headwinds last year saw a rush to gold as a safe haven before the market transformed in Q4. We also spoke to a range of gold miners of all shapes and sizes. Hummingbird Resources managing director Daniel Betts went into depth on the Yanfolila gold project in Mali and its journey to production and Anaconda Mining’s Dustin Angelo told us about gold mining in Newfoundland, along with a variety of forthcoming gold projects from around the globe. Then came the hot topic of 2017 – lithium. A Deutsche Bank study revealed that electric vehicle (EV) sales are expected to grow to over 16 million vehicles by 2025, a dramatic uplift from the 5-6 million range this year. We identified that EVs will be the main driver behind demand growth for lithium, a key component in the lithium-ion batteries used to power EVs. The RGN team focused on lithium as an energy metal, highlighting one of the world’s premier zones for hard rock lithium extraction in the Québec spodumene belt. Guy Bourassa outlined how Nemaska Lithium’s Whabouchi project has paved the way for lithium development in the area and Lepidico’s Joe Walsh explained how unique processing technology can unlock potential for lithium in Québec. We also interviewed Critical Elements with regards to their forthcoming Rose project as well as spotlighting MetalsTech’s Cancet lithium deposit. Moving into renewables and focusing on wind power there were major gusts of change in 2017. New projects across the world are now coming in at price parity with conventional grid power and the landscape for clean energy generation is transforming. In addition to the financial attraction, there has also been a conscious shift towards less polluting and less harmful energy production, typified by the Paris Climate Change Agreement, less America’s participation; see Donald Trump. RGN looked at a selection of innovative and unique wind power projects with the headline piece centring on the Lake Turkana Wind Power Project – the largest single private investment ever in Kenya and Africa’s largest wind project. Our renewables issue also featured an extended report on the launch of GE/Tennet’s DolWin3 offshore wind energy converter, after the RGN editorial team visited Northern Germany to witness first-hand the inauguration of the device dubbed ‘a nuclear power plant in the sea’ by its general manager Patrick Plas. September brought our first spotlight on Botswana, one of the fastest growing economies in Africa. A significant driver of the Southern African nation’s growth over the last few years has been its buoyant mining sector. President Ian Khama’s legacy of developing infrastructure combined with the country’s abundance of resources, particularly diamonds, has seen strong growth in exploration drilling in the last decade or so – providing a boost to the overall economy. The improved transport and telecommunication networks have made it easier for companies to explore far flung locations and the established mines such as Orapa and Jwaneng have entered new cuts – all of which have led to a robust mining sector. We spoke with different players throughout the mining value chain in Botswana, including an exclusive interview with Botswana Chamber of Mines CEO Charles Siwawa. We also spoke to miners in the shape of Tlou Energy and Mount Burgess Mining as well as contractors Atlas Copco and Stefanutti Stocks to round of the issue. In the last RGN of the year, we focused on Canada and the Toronto Stock Exchange. We featured the usual assortment of mining companies with exciting projects dotted across the globe, including developments of various minerals and commodities stretching across several regions in the Americas, Africa and more. The TSX is the unifying thread amongst these disparate projects in wildly contrasting settings, with the exchange providing a robust environment for mining outfits of all shapes and sizes to thrive in. RGN spoke to Ungad Chadda, president of capital formation, equity capital markets, at TMX Group, the holding company for TSX and TSXV (Toronto’s junior exchange) in an exclusive feature which demonstrated the strength and breadth of its mining ecosystem. The spotlight also fell on a host of Toronto-listed mining juniors, including Alphamin Resources who are advancing a responsible tin mine in Democratic Republic of Congo. We also checked in with South America-based miners Golden Arrow Resources and SILVER impact, along with mining service providers Capital Drilling. All in all, it’s been another interesting year for the global resources community, and one that has produced many more positives than 2016 did. Myself and everyone here at RGN hopes to see this story of growth continue into 2018, and we would would like to extend our thanks to our featured companies, contributors and readers over the course of the year, and look forward to working with you again in the near future.